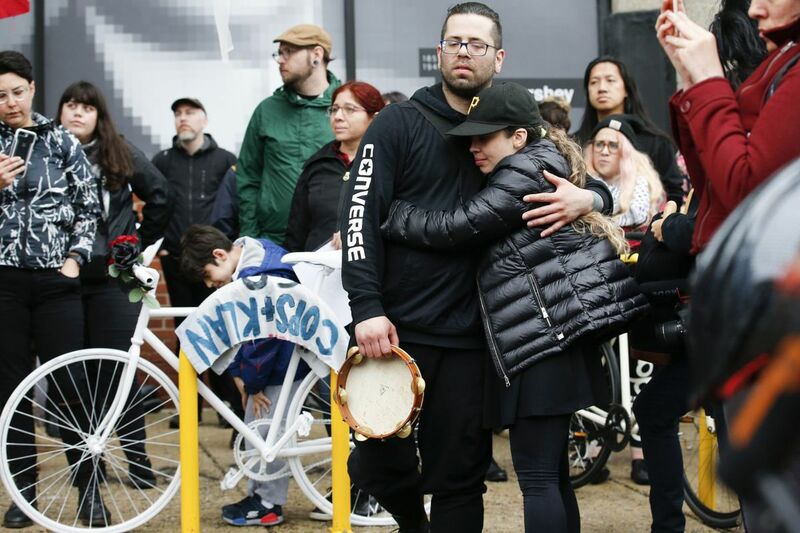 Bryan Avendano (center with tambourine), brother of killed bicyclist Pablo Avendano, is comforted during a Ghost Bike memorial at the corner of 10th and Spring Garden Streets. He was killed while working for a food delivery service. Now there's a new one, a memorial "ghost bike," the wheels, frame, and handlebars painted a flat white and set into place Saturday evening at the Spring Garden intersection where courier Pablo Avendano was struck and killed last weekend. In a steady rain, scores of friends, family, and fellow riders christened the site with tears, songs, and curses. The crowd was so large it shut down the eastbound lanes of Spring Garden Street. Speaker after speaker blamed Avendano's death on an American economy that assigns little value to workers and, for couriers, pushes them onto the streets for low wages and at dangerous risk. "I'm so … angry he died," his girlfriend, Anne Marie Drolet, told the crowd, her voice amplified through a bullhorn. "He cared about what was happening in the world." The two had dreams of moving to Spain and becoming teachers, she said, of maybe even having a child together. Now that's gone. Avendano, 34, died last Saturday, struck by an SUV on Spring Garden near 10th while working for a food-delivery service, Caviar, police and friends said. His public memorial was held in a city where biker-driver relations can be contentious, and the day after an 11-year-old boy on a bicycle was hit and killed by an SUV in South Philadelphia. Last year, Emily Fredricks, a 24-year-old pastry chef, was killed in a bike lane at Spruce and 11th Streets while on her way to work, leading protesters to form a human bike-lane barrier and call for more protections for bicyclists. In March, Mayor Kenney announced the city would create some parking-protected bike lanes — a physical barrier separates the lane — in Center City. He entered office saying he wanted to create 30 miles of protected lanes. Currently, Philadelphia has about 200 miles of bike lanes, but only about 2.5 miles are protected. "All of us at Caviar were deeply saddened by this horrible tragedy," said Katie Dally, a spokesperson for the company. "Our thoughts are with Pablo's family; we will work closely with authorities and assist in any way we can." The firm was working to contact the family and see what assistance could be offered, Dally added. Payment of Avendano's funeral expenses. Classification of riders as employees, not independent contractors. Starting salary of $20 an hour, health benefits, hazard pay, and bike repair-and-maintenance reimbursement. Respect for workers' right to organize a union. READ MORE: After Caviar courier's death, what about gig workers' rights? Avendano, of Point Breeze, was riding eastbound in the bike lane on Spring Garden Street about 7:40 p.m. when he was struck by a 2011 Mitsubishi Endeavor, also traveling east, authorities said. Avendano was knocked off his bicycle and then run over by the SUV, police said. On Saturday, 200 friends and riders gathered at 10th and Spring Garden to mourn and remember. A nearby tree had become a makeshift monument, with three dozen prayer candles and half as many beer cans circling the base, and flowers fixed to the trunk. Someone had spray-painted "Rest in Power" in the street. For this service, the flatbed of a red Chevrolet Colorado served as stage, a tambourine the musical accompaniment. The phenomenon of ghost bikes has spread across the nation and around the world, simple, somber monuments to riders who have been killed by cars. Philadelphia has at least two — now three — and more stand in suburban counties. Speaker after speaker said they loved Avendano, that he had helped them, that he changed them, made them better. "He loved the world, and he loved us," said Caleb Gallus, who helped organize the event. Friend George Ciccariello-Maher called Avendano "one of the most beautiful people I ever met." He was heartbroken, but also angry, Ciccariello-Maher said. "Pablo was killed because people were making money off of what he was doing," he said. "He was nothing to them."